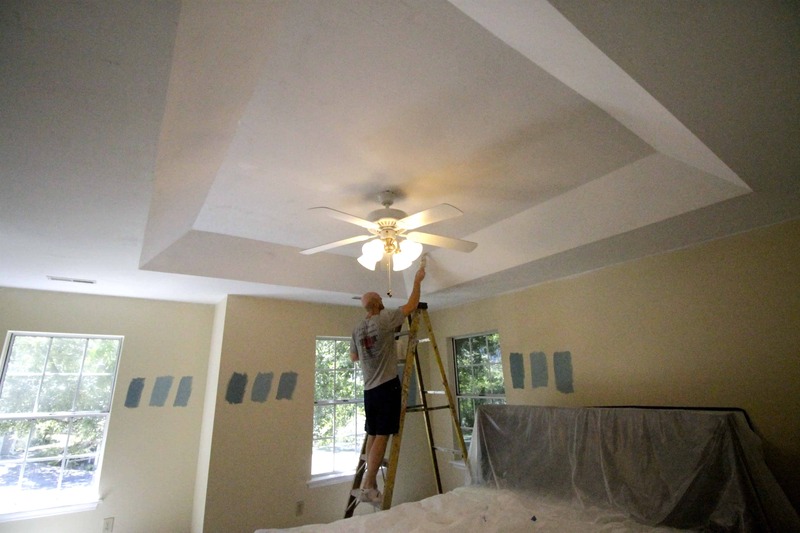 If you are house hunting and seeing a lot of houses built in the 90’s in the south, there is a good chance that you are seeing a lot of popcorn ceilings. In fact, pretty much every house that we looked at had it! I don’t like popcorn ceilings because they attract dust and spiderwebs and also the texture casts small shadows on itself making the room look darker. Don’t want to scrape? Here is how we covered popcorn ceilings with beadboard and a coffered ceiling! 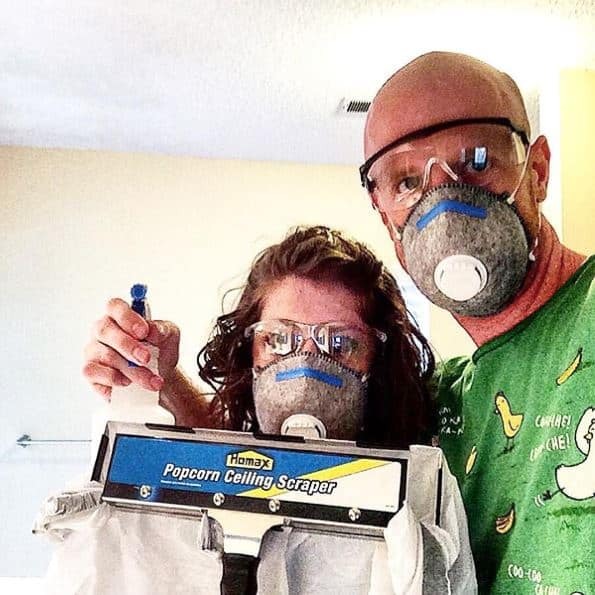 It is our mission to remove all of our popcorn ceilings. 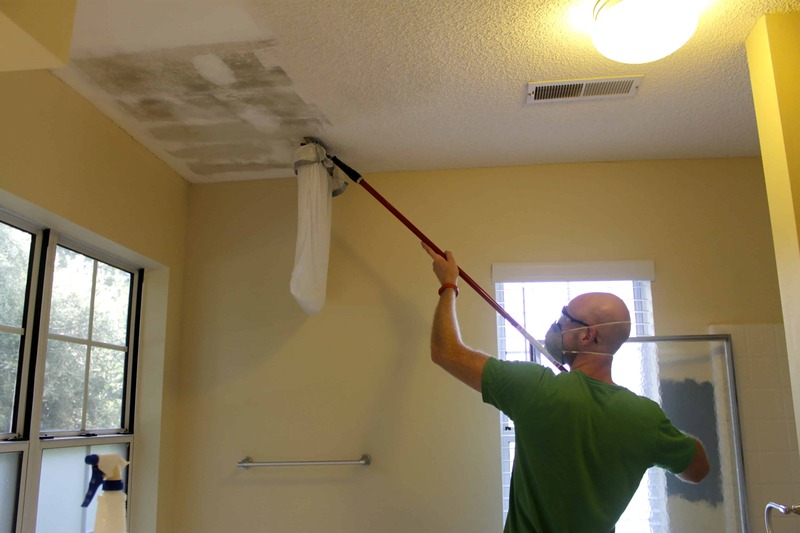 That will entail scraping every ceiling in the 1,800 square foot house. Closets included! So far, we have scraped the ceilings in our master bathroom, guest bathroom, and master bedroom. At this point we feel comfortable enough with the process to give you some insight, tutorials, and tips. WARNING: If your ceilings were put up prior to 1980, they are almost certainly made from asbestos. Asbestos = bad. Have a certified professional come take a look. Clear out the area. Remove anything that you can from the room. Remove any blinds or ceiling lights. Lay plastic over your floors. 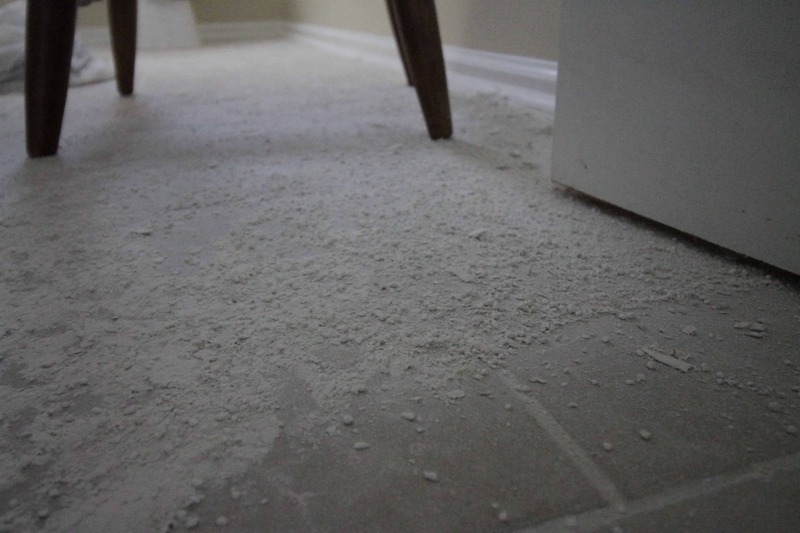 If you are in a carpeted room, strongly consider self adhesive plastic sheets and cover all of your walls. Working in a 5 foot by 5 foot area, spray the ceiling with water. Wet popcorn peels off like butter. Dry popcorn, not so much. Let sit 2-3 minutes. Use your scraper to scrape the ceiling. Use long, slow strokes. 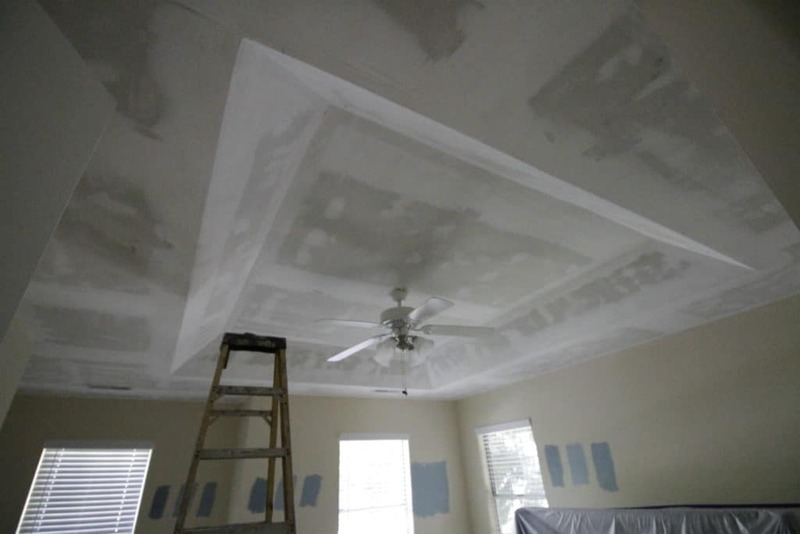 If it’s not coming off easily, adjust your angle on the ceiling or consider re-spraying. Repeat over the entire room. Using a sander, sand any spots that need a touch up to be more smooth. This is super messy, but really gets you that flat finish. Clean up! A shop vac and a sponge are suggested. Roll paint over the ceiling. It took us 3 or 4 coats to get a good finish. Wear eye and face protection! This is a messy process. Use a popcorn scraper that allows most of the popcorn to fall directly into a trash bag. Make sure you use eye, nose and mouth protection, especially during the sanding. It makes a lot of dust that is very bad. Try to keep your scrapper at the closest angle to flat as possible, roughly 15 degrees. The less of an angle, the easier it slides along the ceiling. Big angles just dig into the drywall. Be patient. Don’t spray and then immediately try to scrape. Let the water sit and it will fall off. Make sure to scrape all the way to the ceiling. Anything left over will start peeling and cracking when you paint and you’ll have to do it again. Here is our best advice for cleaning up afterwards! Have you scraped ceilings? I’d love to hear your thoughts and difficulties below! 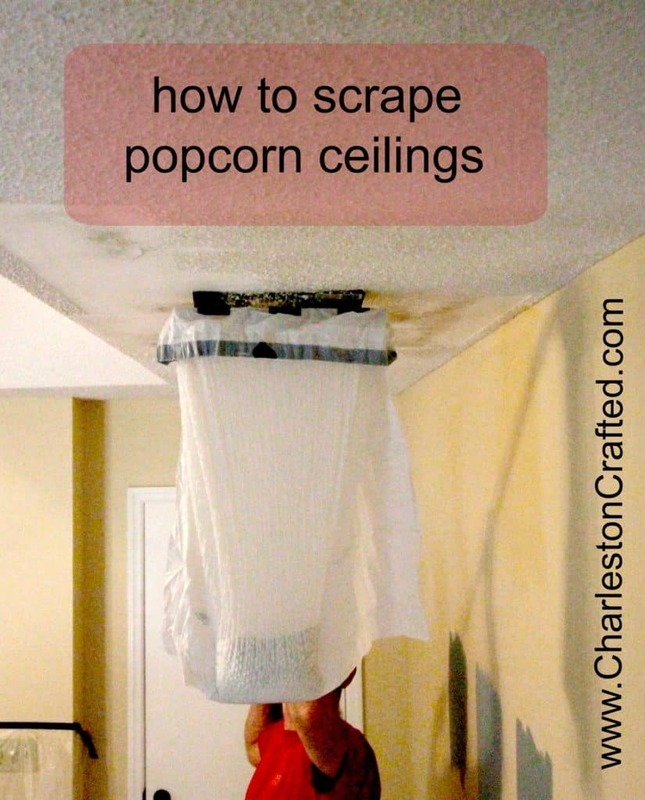 I like that they are called Popcorn Ceilings where you live – we just call them Artex ceilings in the UK and that doesn’t sound nearly as good. They have fallen out of fashion here as well. You’ve shared a great post here – I’ve pinned it to my decorating and DIY board on Pinterest. Thank you for being a part of our Hearth and Soul Hop. Hope you will visit and share again this week! I know the name popcorn almost makes them sound fun 🙂 Thanks for stopping by!